The Score Bar now shows your EdReady score (inside the purple circle). Each time you demonstrate an improvement of your knowledge, this score will increase. The Units and Topics included in the study path are again listed, but now each has a status (i.e., a categorical score) based on your most recent test results. 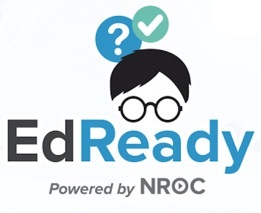 As you improve your knowledge in EdReady, each status will update accordingly. When you are ready to move on, click the Next button. Note: because goals within EdReady can be set up in many different ways, you may see a button directing you to your Study Path instead of the Next button. If so, click the button to continue and go to the Study Path section of this User Guide.